Last week, amid the general hubbub of last week'sCES 2012, one announcement that didn't receive quite the fanfare that it should have was the limited edition Fujifilm X100. Fujifilm had a hit on its hands when it unveiled the X100 back in 2010. Its retro looks and traditional styling appealed to vintage lovers across the globe. Now, for those wanting to stand out even more, Fuji has released a black version of the popular model. Originally cast in silver, the new black edition will be limited to a 1000 model run and will cost an extra $500 (around £326) for the privilege. However, the extra money does also get you a leather case, metal lens hood, metal adapter ring and protector filter. The Fuji X10, the X100's smaller brother, which was announced in 2011, also features a black design - as does the newly announced Fujifilm X Pro1 compact system camera. Each of the black X100's sold will come with a unique serial number verifying its limited edition status. The standard X100 currently retails for around £800. Other specs include a hybrid optical and electronic viewfinder, a fixed length 23mm f/2.0 lens and incorporated ND filter. A 12.3 million pixel CMOS APS-C sized sensor can also be found on board. All of these features will of course be available on the limited edition cameras. 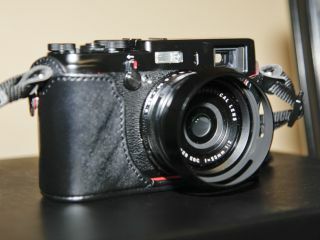 A Fujifilm X100 Limited Edition UK price has yet to be fully confirmed, neither has availability. In the meantime, enjoy these pictures taken at CES.